Iryna, Marla, and Marina together at the start of the event. Photo © 2018 RJH. 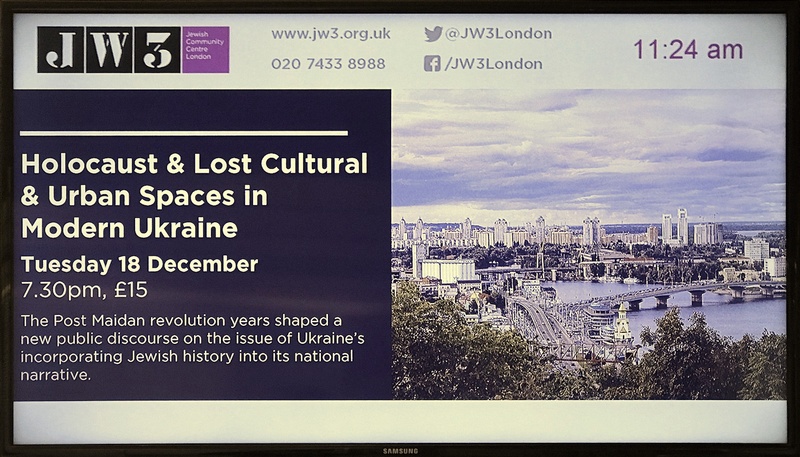 We are proud that Rohatyn Jewish Heritage was invited to take part in a panel discussion at the Jewish Community Center of North London (JW3) on the topic of “The Holocaust and Lost Jewish Cultural Presence in Ukraine”, an event co-sponsored by the Ukrainian Institute London and Ukrainian Jewish Encounter. 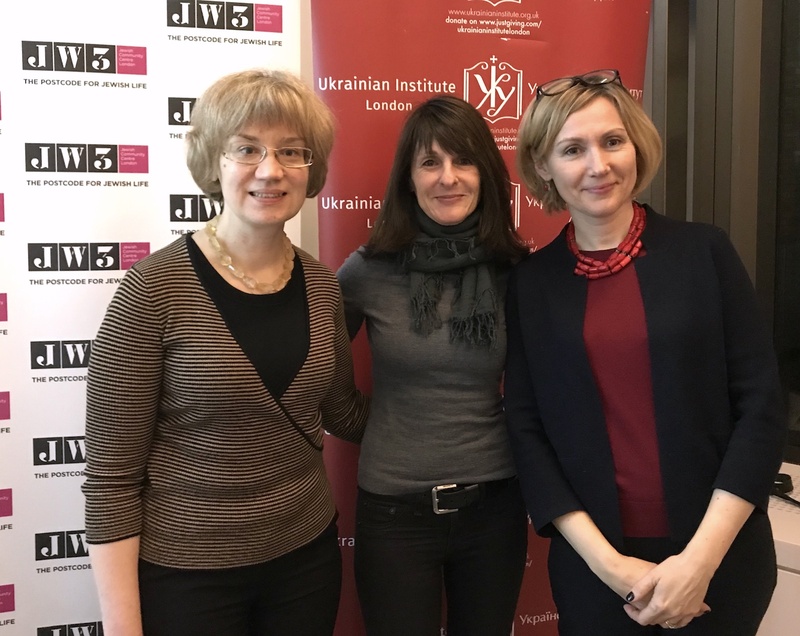 I shared the panel earlier this week with Dr. Iryna Starovoyt, from the Jewish Studies Department of Ukrainian Catholic University in Lviv, and moderator Marina Pesenti, Director of the Ukrainian Institute, London. It was a great opportunity for me to present our experience working in Rohatyn and western Ukraine, but especially to hear the thoughts and concerns of the other presenters and members of the audience. Cities live longer than the language and traditions of their founders. [As residents] we inherit more than one history. We are heirs to complete transformations of local residents, to conflicting memories and landscapes of violence and guilt. The addresses which became the last places for some… the communities that no longer exist… the former residents, exterminated. The landscapes of trauma are an open wound. Marla’s presentation in progress. Photo from the Ukrainian Institute video (see below). I opened my portion of the panel with this quote from a 2016 lecture given in Lviv by my co-panelist Dr. Starovoyt at the Center for Urban History of East Central Europe. Building on this, I went on to speak about Rohatyn Jewish Heritage and our work over the last seven years: from recovering Jewish headstones from roads, walkways, and private gardens in town, to projects aimed at re-establishing a presence of Jewish memory among today’s Rohatyn residents, students, and educators. Among other topics, I cited our collaborative work with the new Opillya regional museum which opened last month in Rohatyn, and which includes a small but dense exhibit on prewar Jewish Rohatyn. Accompanied by a dozen slides, I gave the audience an impression of these projects as well as the locations, conditions, and challenges of Rohatyn’s two Jewish cemeteries and wartime mass graves. Featured were images from last summer’s collaborative clearing projects with American, Ukrainian, and Polish friends, and ongoing projects to document wartime memoirs and those who aided Jews. A display board announcing the event at JW3 in London. The second part of my presentation highlighted Jewish heritage projects which have been initiated by Ukrainians in western Ukraine, such as in Rudky, Radekhiv, Burshtyn, Staryi Sambir, and Lviv, in order to shine a light on local activists who tend to be “off the radar” of Jewish descendants living abroad. Many of these Ukrainian heritage activists are documenting family histories and prewar Jewish-owned buildings and neighborhoods, and caring for the surviving Jewish heritage (cemeteries, wartime mass graves) in their hometowns. Several of these activists were honored in Lviv in September for their important work in recovering Jewish memory and preserving the heritage. Iryna’s presentation in progress. Photo from the Ukrainian Institute video (see below). Dr. Starovoyt then spoke on the larger issues of shared memory in places of trauma and genocide, highlighting that since independence, there is a new openness in Ukraine – academically and intellectually – for discussing historic tragedies in what she calls “this country of memory”. She noted that the openness has been accompanied by projects of recovering prewar Jewish spaces, such as in Lviv at the site of the ruin of the former Golden Rose synagogue: a space of memory that today invites visitors to contemplate the violent “interrupted existence” of Lviv’s 750-year old Jewish community. There are other examples of such spaces across Ukraine; quoting Dr. Sofia Dyak, director of the Center for Urban History of East Central Europe in Lviv, Dr. Starovoyt noted that the sites have given back to Ukraine the “possibility to know” what happened during the Nazi occupation. Dr. Starovoyt went on to add that wider public debates and new international publications on the Holodomor (the man-made famine imposed by Stalin’s Soviet system, which killed millions of Ukrainians in the early 1930s) have also led to a better understanding by Ukrainians about terrors experienced by Jews during the Holocaust, leading, in her opinion, to a new empathy for “other” (non-Ukrainian) victims. Finally, drawing upon examples from her own youth growing up in Soviet Lviv, and now as an historian and educator in independent Ukraine, Dr. Starovoyt then discussed positive changes she sees in the availability today of historical records and in the resources now included in the public school system (referencing among other materials the texts available to her teenage daughter). Marina moderating the discussion. Photo from the Ukrainian Institute video (see below). Marina Pesenti then opened the floor to questions and comments, which lasted nearly as long as the presentations themselves. Afterward, a number of audience members came up to introduce themselves. Among them were several friends and family historians whom we know from past international Jewish genealogy and heritage-related conferences, including members of the Jewish Genealogical Society of Great Britain (JGSGB), Michael Maill of the UK-based Foundation for Jewish Heritage, and Harald Binder, president of the foundation board of Lviv’s Center for Urban History. It was delightful to also finally meet several friends from Facebook who have been following our work in Rohatyn and are great supporters on social media. A glimpse of the audience as the discussion proceeds. Photo © 2018 the Ukrainian Institute London. 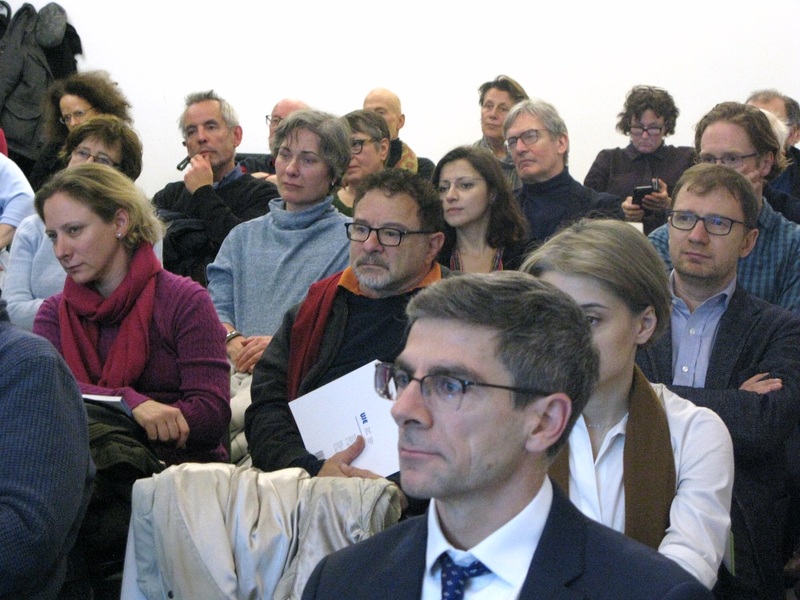 In addition to the panelists, about fifty people attended the one and a half hour event. The event was video recorded; that link is provided below. We thank our dear friends at the Ukrainian Institute and Ukrainian Jewish Encounter for the invitation, and for organizing and managing travel arrangements and London accommodations. We look forward to seeing you again soon. 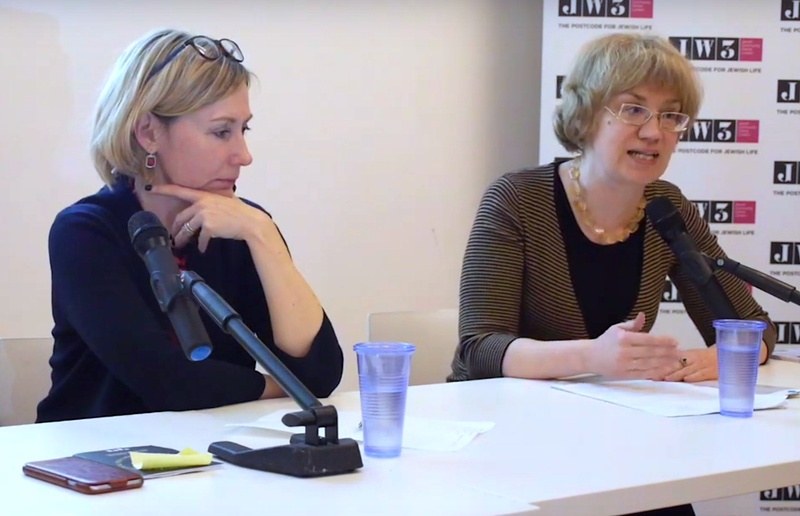 The Ukrainian Institute London published a description of the panel discussion ahead of the event on their website, and a 43-minute video of the panel portion of the discussion on their YouTube channel (click on the image below).